The reason that I love this dish is because it's a little bit different and contains cannellini beans which are super healthy. 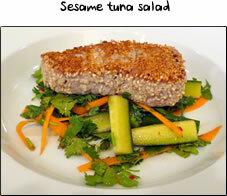 There are loads of different textures and flavours going on, but no one flavour overpowers the dish. 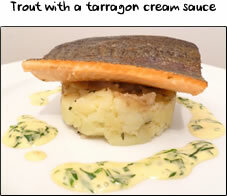 I use seabass in my recipe as the casseulet itself is quite strong tasting and seabass has enough flavour to compete. 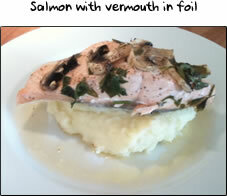 This is a great alternative to a nice casserole and a must for any fish lovers. Before you start, have your potatoes boiled, drained and back in the pan. Have all your other ingredients ready chopped, with your tins open. Put your larger pan on a high heat and click here! Firstly you need to add about a tablespoon of oil to your larger pan and add the shallots and garlic and then stir. You only need to cook these for 30 seconds or so as the pan starts to heat up. Next add in the bacon and give it a stir to stop anything sticking. Cook for 1-2 minutes until the bacon just starts to brown. Keep stirring to ensure that nothing is sticking. Once the bacon has started to brown, add in the chopped tomatoes and give it a good stir. Next you need to add a teaspoon of paprika and a pinch of cayenne pepper. Lastly add in the cannellini beans and give everything a good stir. Turn the heat down to a gentle simmer and turn the pan for the fish onto a high heat. 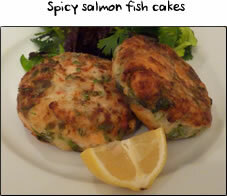 Whilst the fish pan is heating up, go and season the fish on both sides with salt and pepper. Add a swirl of oil to the pan and then place the fish, skin side down in the pan for 1 minute on each side. Leave the fish and give your hands a wash, then turn the heat on for the potatoes. When you turn the fish, the skin should be nice and crispy. 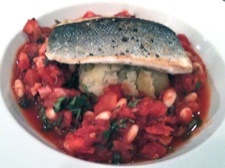 Seabass fillets are generally very thin, so 2 minutes cooking should be plenty. Add about a teaspoon of oil to the potatoes and give them a stir to coat them. You just want to get a bit of colour on the potatoes. Remove the fish from the pan to a board to rest. Next, give the casseulet and the potatoes a good pinch of salt and pepper and stir. You can turn the heat off the potatoes now and start crushing them, using a fork against the side of the pan. Remember you're not making mash, so it's supposed to be lumpy! Add 2-3 tablespoons of extra virgin olive oil to the potatoes to moisten. The only thing left to do is to stir the chopped parsley into the casseulet and then you're ready to serve. To serve, put a spoonful of the potatoes onto the middle of your plate or bowl. Using your hands (they should be clean) shape the potatoes into a little mound in the middle. Next, spoon the casseulet all around the potatoes before carefully placing a fish fillet skin side up on top of the potatoes.